2 Louisiana Officers Arrested In Fatal Shooting Of 6-Year-Old Boy : The Two-Way Two of four local deputies involved in a shooting in Marksville, La., are charged with second-degree murder. The police chase that ended in gunfire Tuesday also left the boy's father wounded. 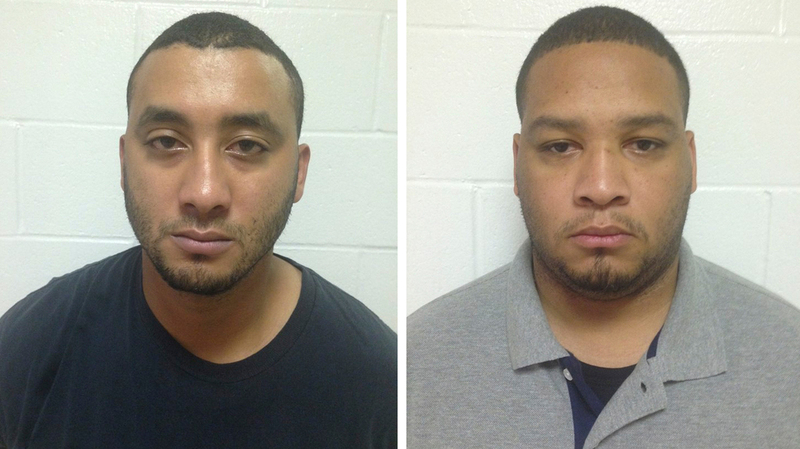 City Marshals Norris Greenhouse (left) and Derrick Stafford are seen in their booking photos provided by Louisiana State Police in New Orleans. They were arrested Friday on charges of killing a 6-year-old boy and critically wounding his father during a car chase. Two police officers have been arrested on second-degree murder charges in the recent Marksville, La., shooting that killed a 6-year-old boy and left his father wounded. Jeremy Mardis, 6, and his father, Chris Few, 25, were reportedly shot multiple times on Tuesday night, when officers opened fire on their vehicle after pursuing Few in an SUV. Two of the four deputies involved in the shooting have been arrested and identified as Norris Greenhouse Jr. and Derrick Stafford, State Police Superintendent Col. Mike Edmonson announced Friday night. The other two officers involved are Sgt. Kenneth Parnell and Lt. Jason Brouillette of the Marksville Police Department. All four were placed on administrative leave following Tuesday's chase. The events that led to the car chase and shooting are still unclear and are pending investigation by Louisiana State Police. However, citing the police body-camera footage of the episode, Edmonson said, "It is one of the most disturbing scenes I have seen." According to The (Baton Rouge) Advocate, Edmonson said Thursday there is no evidence that Few had a weapon in his car. Two of the four officers have refused to speak to authorities, but Edmonson declined to say which police officers remained silent. "The parish coroner said earlier this week that the officers were serving a warrant on Few when he fled, but Edmonson later said he had no information about a warrant. "Few's 57-year-old stepfather, Morris German, has accused the marshals of indiscriminately opening fire on the vehicle. German said Few was heavily sedated, unable to talk and has bullet fragments lodged in his brain and lung. He described Few as a loving father and added the man's son 'was his whole life.' "
Jeremy Mardis, a first-grader with autism, is the youngest police-shooting victim this year.